As we all know too well, the first step in any project is to build a project plan. But knowing exactly where to start when it comes to planning a project as colossal as an enterprise desktop migration can be baffling for even the most experienced of project and program managers. 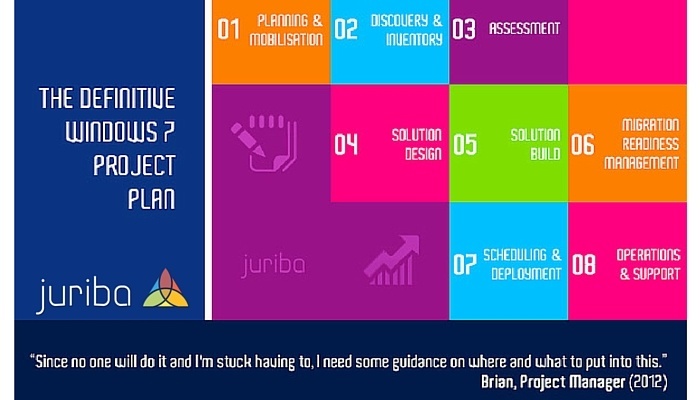 Well, we hear you, Brian, and that’s why Juriba are providing a free and fully loaded Windows 7 Project Plan for your Windows 7 migration. With our Windows 7 Project Plan, we’ve done some of the heavy lifting for you. But the beauty of it is that it is simply a plan – you can amend the tasks, dates and structure, to ensure the plan is tailored solely to work that needs to get done in your project. No need to start from scratch and no need to be exposed to any unnecessary risk when it comes to your Windows 7 migration. Finally, as this is a resource which can benefit our entire community, we openly welcome suggestions for further sections or tasks which users would like to see added to the Project Plan. To share any insight, please feel free to send a Tweet/direct message to @Juriba on Twitter or leave feedback on our download page.